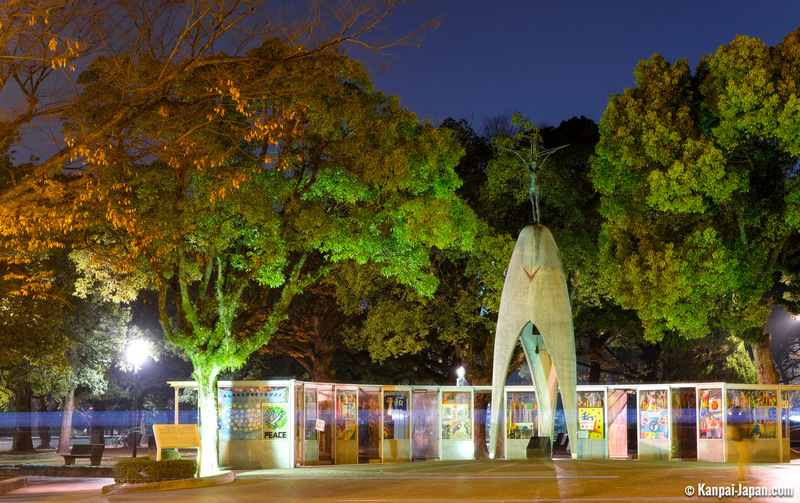 The memorial peace park is a public garden located on an island in the middle of the Ota river, in the heart of the city center, in the Naka-ku ward of Hiroshima, Japan. 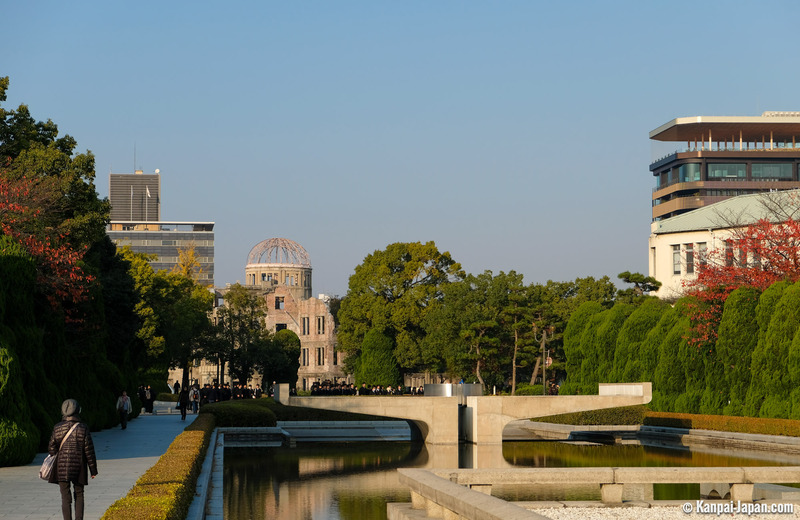 Indexed at the National Heritage in 2007, it is, with the museum and Genbaku dome, one of the baneful symbols of the 1945 nuclear bombing. 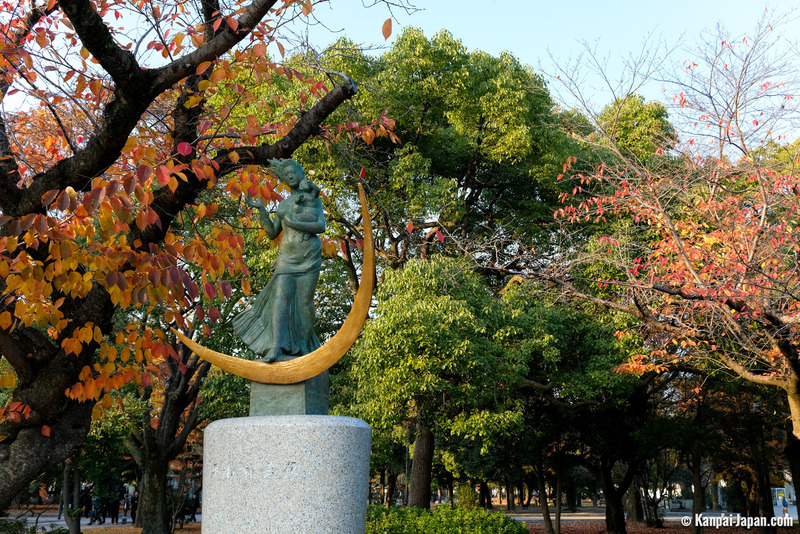 This broad green area possesses in its heart about sixty monuments dedicated to this tragic event of human History. 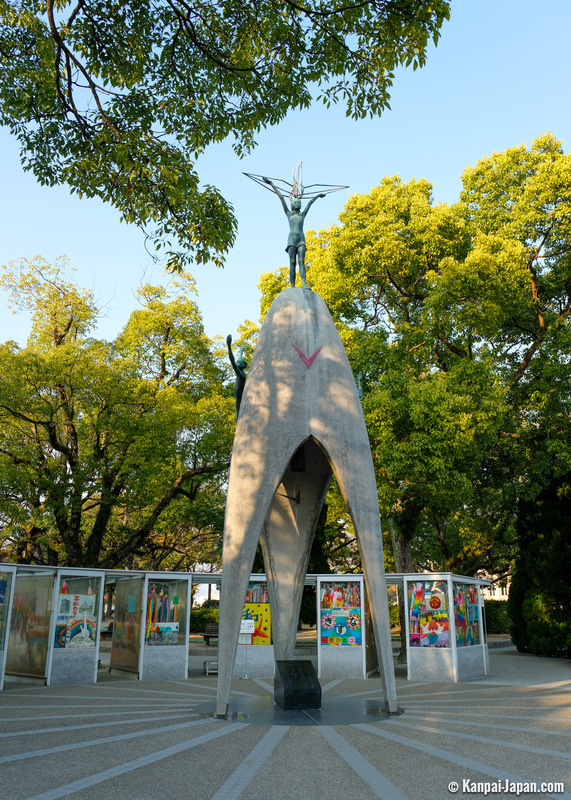 The opening of the park was decided following the ratification of the "Hiroshima Peace Memorial city construction law" which was passed on August 6th, 1949, 4 years after the nuclear bomb explosion. 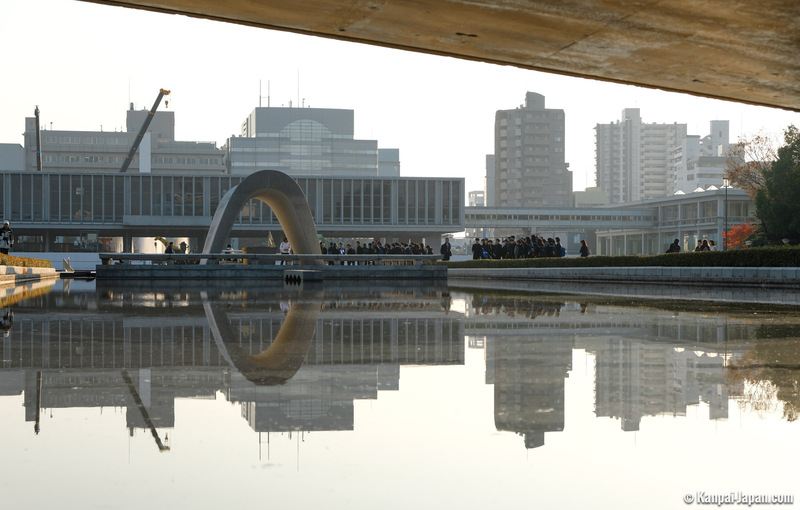 This broad area was designed by architect Kenzo Tange. 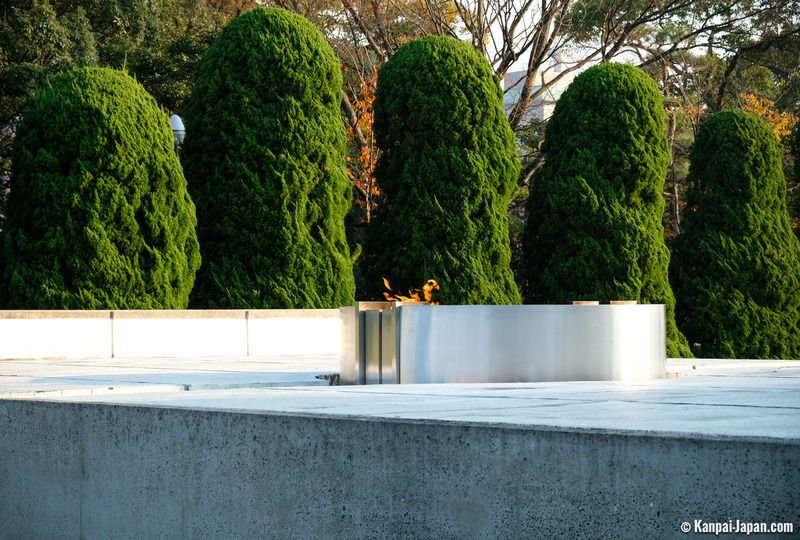 Then, the place has been renovated for its 50th anniversary of the commemoration for the nuclear bomb victims. Every year at 8:15am sharp, time of the first bombing, the ceremonial of souvenir is celebrated. 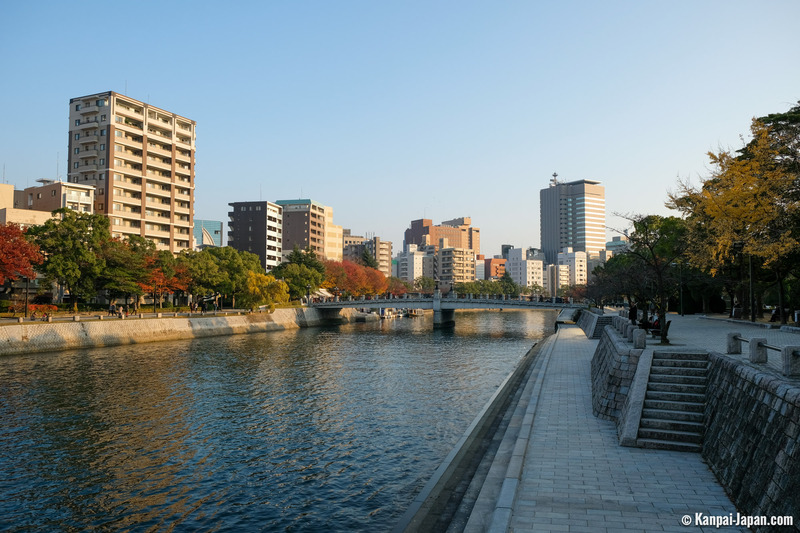 Several ways allow to access the park, but it is advised to visitors to arrive by crossing Motoyasubashi bridge or by taking the entrance of the Northern part of the Peace Boulevard. By taking this itinerary and passing by these first buildings, we directly arrive on a huge alley with the first main monument, the easily recognizable Cenotaph. 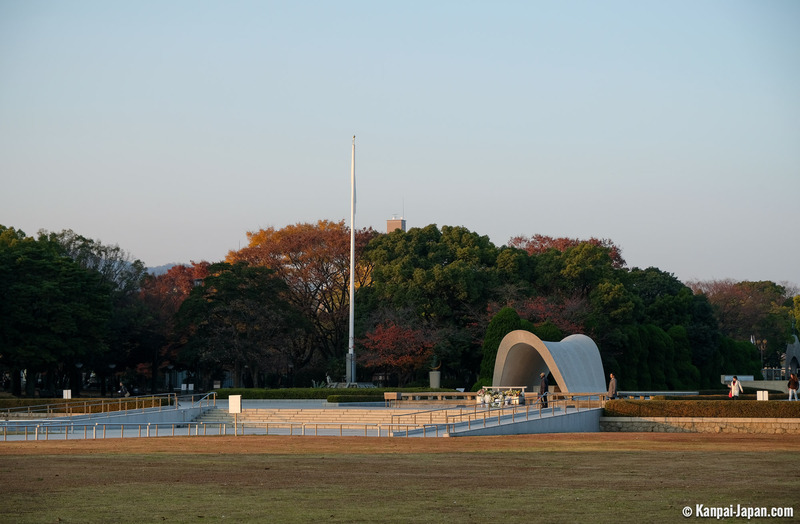 By observing the center of this granit structure, we have the possibility to see the famous Genbaku dome at the end of this vast park, and at the firstground, the flame and the peace pond remarkably aligned. After observing a minute of silence in front of this modern and beautiful architecture, we end up a little further at the Chldren Peace Monument. 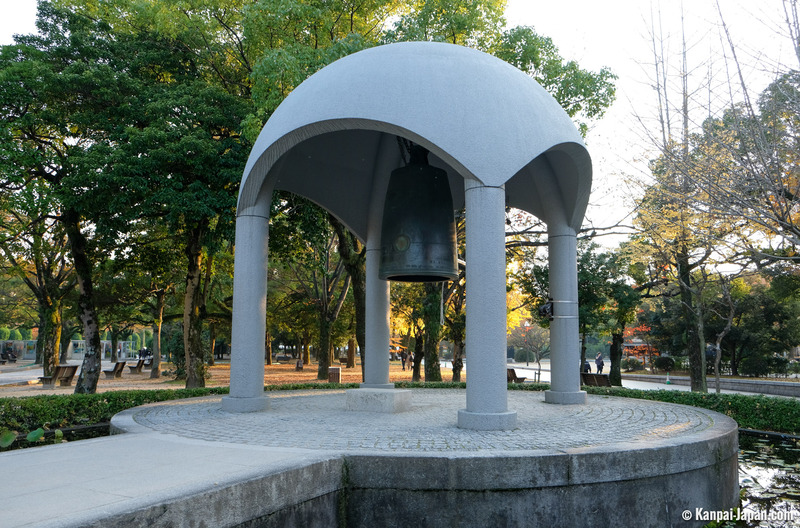 Composed of a bell on which there is a girl statue, holding in her arms a metallic crane origami, this piece of art was built for the souvenir of the deceased Sadako Sasaki ; young girl who died in 1955 from leukemia caused by nuclear radiations. 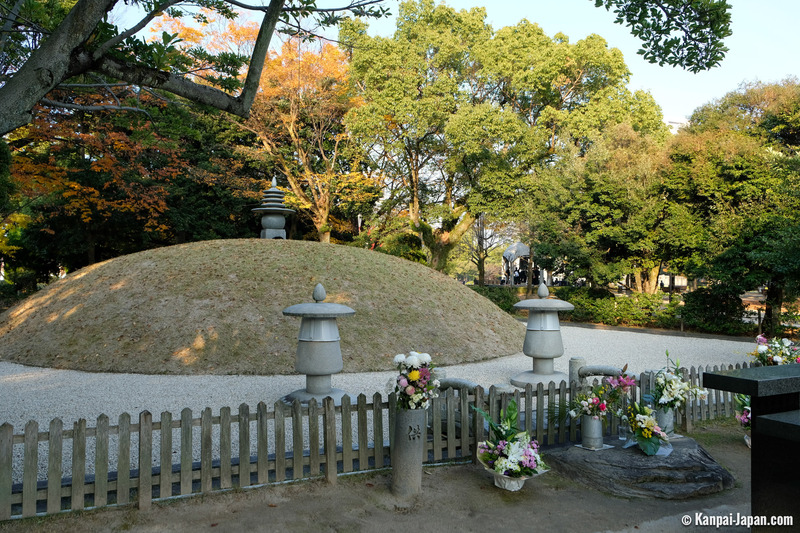 Sadako, when discovering her illness, started to engage with her classmates for the construction of a monument dedicated to ill children. 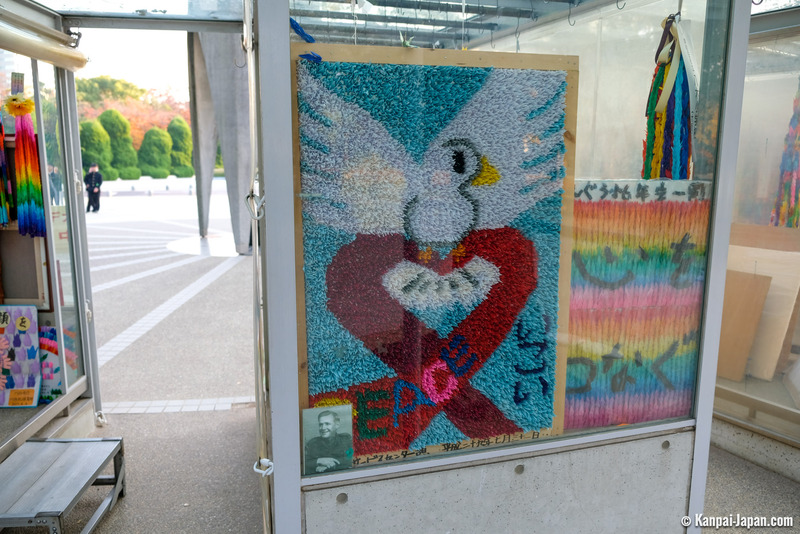 It is finally the whole country which was moved by this story, and the memorial was settled in 1958 thanks to generous donations coming from 3,200 schools of Japan as well as from 9 other countries. 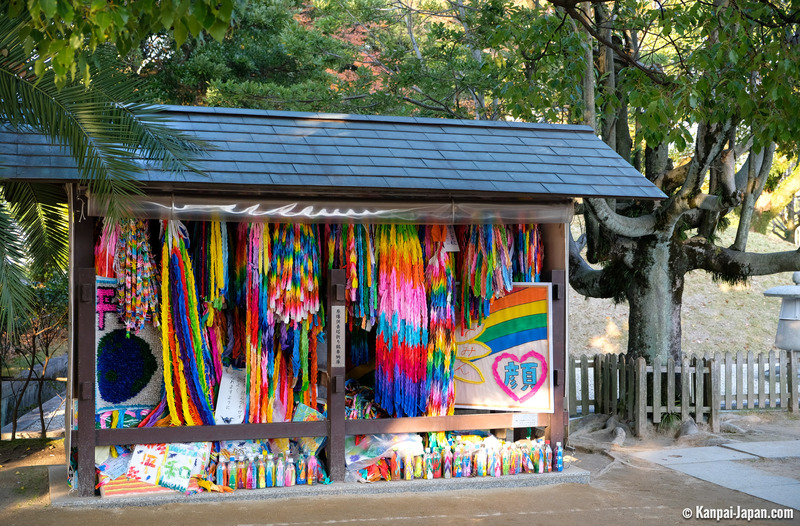 Windowed compartments are home of thousands multicolored origami cranes, offered by visitors of all nationalities, surround the statue. 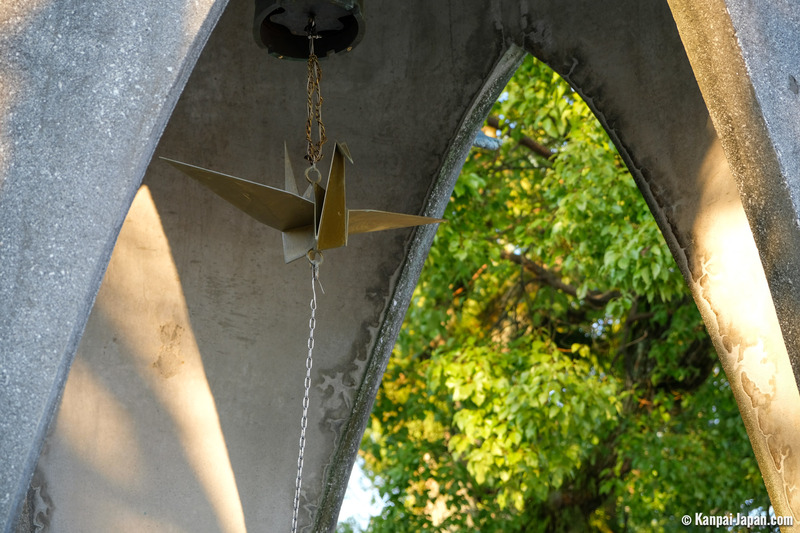 These fragile and poetic birds remind us the main goal of the place, which is to offer to the next generation a peaceful and better future. 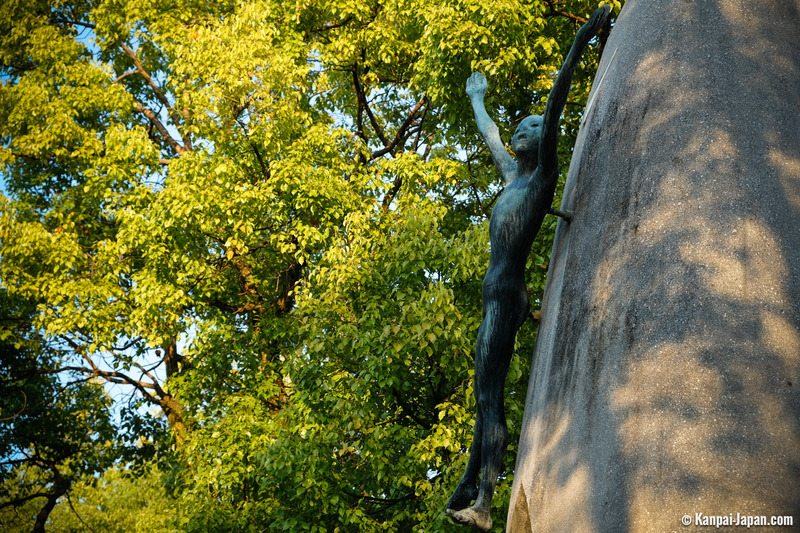 By visiting Hiroshima Peace Memorial Park, we obviously feel overwhelmed by this heavy and terrible tragedy. And yet, just by looking away from the numerous headstones all along the path, observing the local population demonstrates the strength of the locals, enjoying the public garden just like any other green place of a big city. 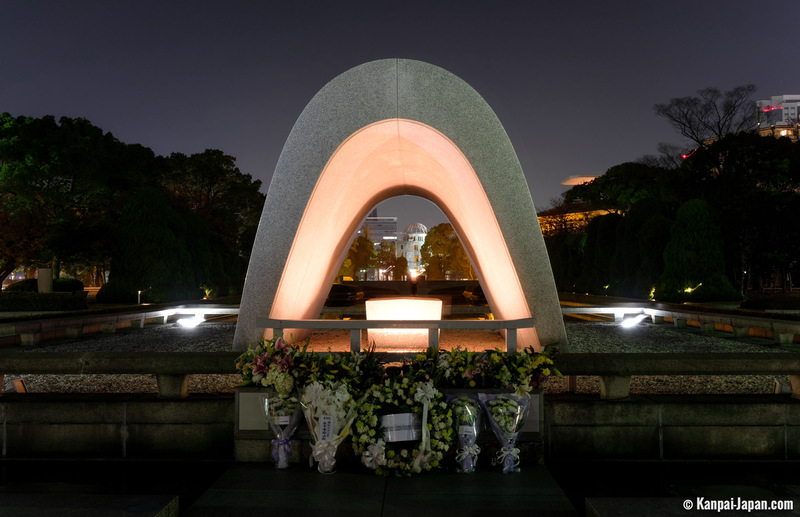 It is exactly the goal of this place: presenting a must-do memorial obligation, but mostly offering a reasonable message about peaceful living among all nationalities, still relevant today.